Bauerfeind's MalleoTrain S ankle braces and supports provide greater ankle stability and security during physical activity. Reliable Support - Bauerfeind's MalleoTrain S ankle braces and supports stabilize the ankle without restricting mobility. Ideal for use during sports, they fit easily into your training regimen and help avoid further injury to the ankle during competition. Better Than Taping - The braces have adjustable straps acts like athletic tape, but are easier to put on quickly and adjust for just the right amount of gentle compression, so you can remain comfortable and able to move freely. The soft knit fabric ensures you are comfortable, because the breathable material provides a cooling effect and draws sweat away from your body. The support is machine washable in the gentle cycle, which helps maintain its elasticity and original fit. Play With Confidence - With a with MalleoTrain S support, you can be confident while playing sports, without worrying about re-injuring your ankle. RELIABLE SUPPORT & INCREASED ANKLE STABILITY: Bauerfeind's MalleoTrain S Ankle Braces and Supports stabilize the ankle without restricting mobility. Ideal for use during sports, it fits into your training regimen and helps avoid further injury to the ankle during competition. BETTER OPTION THAN TAPING YOUR ANKLES: The braces have adjustable straps acts like athletic tape, but are easier to put on quickly and adjust for just the right amount of gentle compression, so you can remain comfortable and able to move freely. The soft knit fabric ensures you are comfortable, because the breathable material provides a cooling effect and draws sweat away from your body. The support is machine washable in the gentle cycle, which helps maintain its elasticity and original fit. 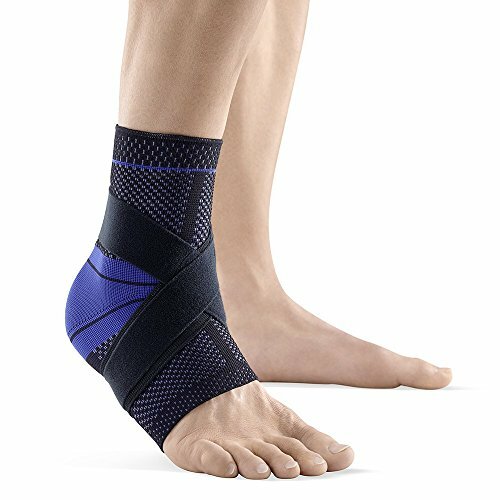 PLAY ALL DAY WITH CONFIDENCE & SUPPORT: With a with MalleoTrain S support, you can be confident while playing sports, without worrying about re-injuring your ankle and protects against lateral twisting. USED TO HELP TREAT & HELP PREVENT: mild ankle sprains, moderate ankle swelling, ankle ligament tear (mild to moderate) and more.